Don’t you love my pun? Hmmm… Well, today was our first day back from the holiday weekend in Florida. It also coincided with laundry day after being gone all week, which meant smallest laundry day ever. So we were free to head out pretty early for us. We had a morning meeting with Amy regarding an art retreat in February! (More to come on that new agenda item.) Plus we had an assignment to visit the folk art exhibit at the NPG, which we managed to do by the end of the day, after the library closed earlier than we expected or Lucy wanted. We picked up lunch and went to the studio. I actually got Lucy to sleep in her tent for an hour! This is the second time I have attempted and succeeded. Granted we probably need better floor cushions. But she slept for an hour. Not quite her typical nap length, but I’ll take it. I started a new book art project I wanted to do for ages. It is progressing pretty well. So I am excited about that. Enough to make me want to go back tomorrow and not face this huge pile of paper on my bed. Ughh… Receipts, cards, bills. Things you have to file or recycle. Or do something even less fun with, like your taxes. 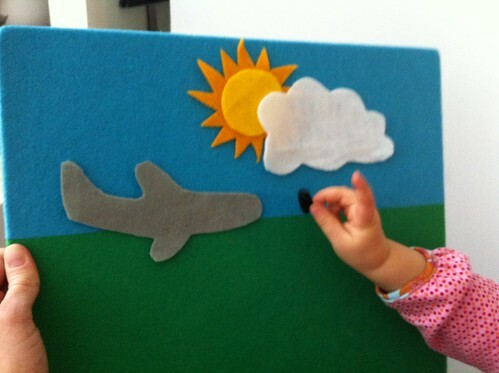 After Lucy’s nap, she brought me this felt board I had propped in front of some hardware cloth, which is like chicken wire, but more rigid. Not very kid friendly. 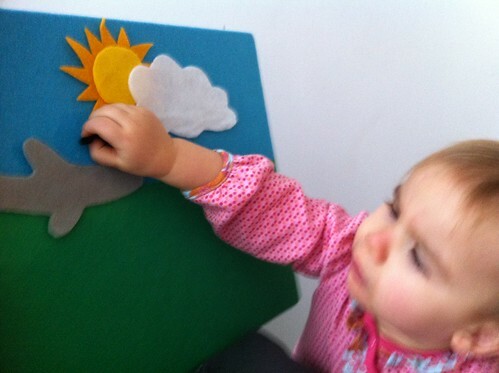 But she seemed to like the felt board. And I spent countless hours cutting our shapes from construction paper in high school and college. Certainly I would like it! I had pulled out my fabrics anyway, so I thought I would cut out some little shapes from sheets of felt I purchased over a year ago from a fabric store. It was so fun! 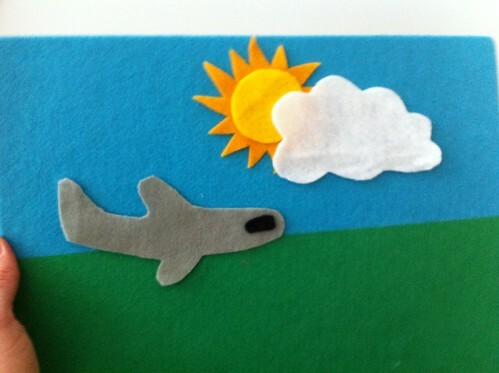 Our first three shapes were a cloud, the sun and a plane, since we rode in a plane yesterday. I freehanded these, if you can’t tell. I may tack the black window on to the plane. But the sun layers are staying together on their own. Plus the sun can double as the moon. Right? I’m excited about coming up with more ideas. But that was enough for today. I picked up this felt board for $3 at Kaplan close to Winston-Salem. They have lots of great educational toys. Plus they have lots of furniture, books and toys in their outlet. 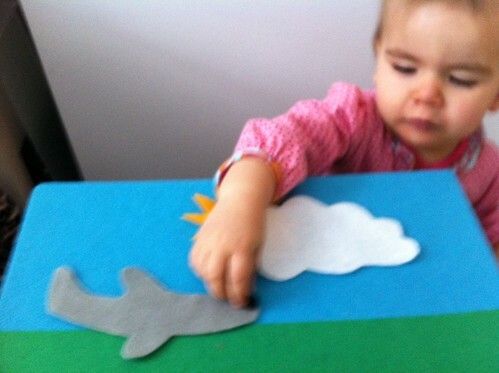 Plus the felt board has a white board on the back. But Danyelle forewarned that dry erase markers are not washable. 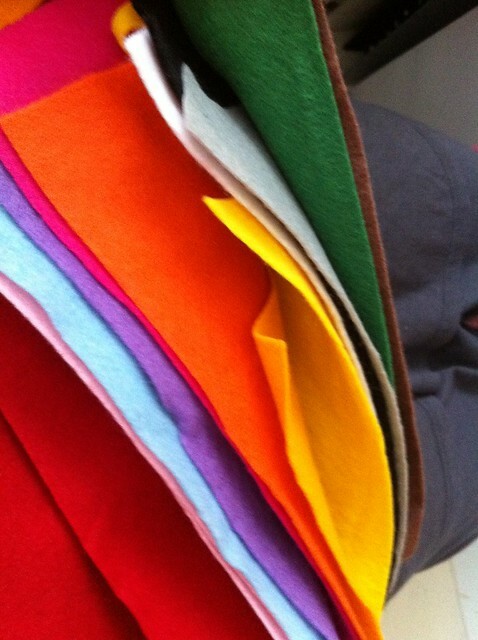 So we will stick to felt for now. yes I love a good pun…so cute!